Did this HUGE snake eat a human being? 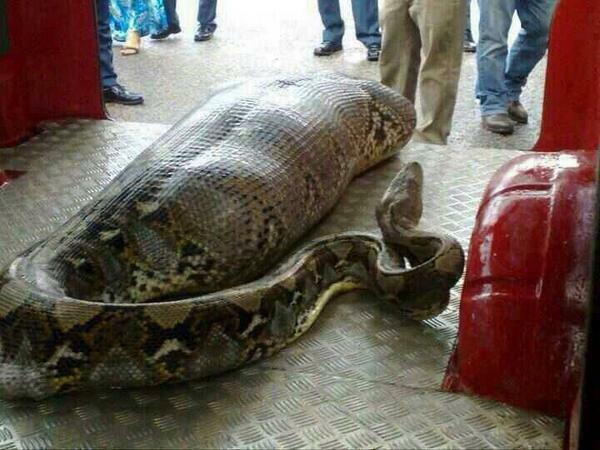 A Python ate a person who was drunk and lying beside the liquor shop. News from Attapady, Kerala. According to the Daily Mail, the origin of the picture is in question, with a number of suggestions as to where it comes from sweeping the net. One Twitter user suggests it was taken in India, where the snake swallowed a drunk man who fell asleep on the street, while another claims the reptile swallowed a woman in Durban, South Africa, in June 2013, and the the image was taken by Linda Laina Nyatoro, a reporter. Some sites, however, including Hoax Slayer, and news.com.au claim the photo is a big fat fake. It reports the Linda Laina Nyatoro did post the picture on her Facebook page, but did not claim to be a witness to the supposed incident. She claims that one of her colleagues was there when a woman’s body was removed from the snake. But this has not been confirmed. The site also says the pictures has been circling online since September 2012 so, whatever it did eat, it was not likely to have been a woman in South Africa in June 2013. While it is not impossible, credible reports of humans being swallowed whole by pythons are very rare. Back in 2002, a 20ft African rock python swallowed a 10-year-old boy whole while he was fruit picking in Durban, reports the Daily Telegraph. This entry was posted in News+Broadcasts and tagged Daily Mail, Daily Telegraph, Durban, Facebook, India, Slayer, South Africa, Twitter. Bookmark the permalink.